August mid-month sales report: Newmarket Prices are higher! Prices are on the rise again! We are more than half way through August, and average prices are on higher than they were in July for Detached, Semi-Detached & Attached/Townhomes! Volume is still well below where is was on August 17 2016, except with townhomes which has the same sales-date, but the prices have all bounced higher after a slow July. So far to date this month there has been 23 sales reported, with an average sales price of $9353,682, which is up by more than $46,000 from the Average sale price in July this year. Now, these sales are quite a bit less than the 54 that were reported this time last year (Reported Sold between August 1 – August 17), but the average price is still higher by more than $47,000 than the 2016 numbers, indicating that while confidence may be coming back to the value of real estate, it’s not in the same level of urgency as it was last summer. We also need to keep in mind that the average sale price is down by almost $250,000 from it’s April peak, which was a sharp correction as it represented a near 20% drop in the average sale price over the course of 3+ months. I do predict detached homes to close out the month around 50 sales, which is still significantly lower than the 109 that happened in August 2016, but with 8 properties currently showing a status of Sold Conditionally (SC Status) I hope that prediction is a conservative one and the actual sales are far greater! The mid month numbers for Semi’s look crazy, but I think thats because July was so slow! So far this month there has been 8 units reported sold this month, which is already 2 more than all of July 2017. The Average sale price is also sitting around $645,000 right now, which is more than $104,000 than the average sale price in July this year for the whole month. 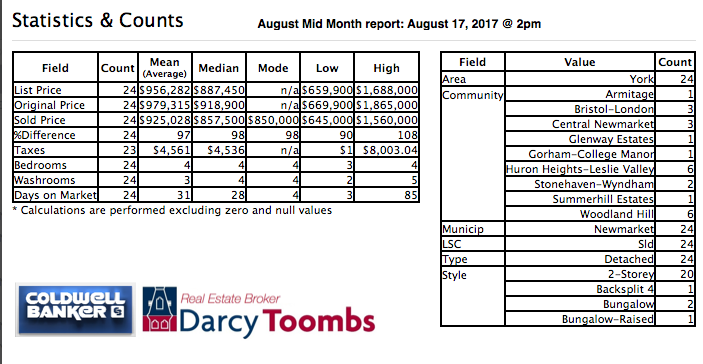 Sales are strong, especially when we compare the figures against the figures of August 17 2016, where there were 6 sales reported to date, with an average price of $611,000. Last month we had 6 sales for the whole month that were all older semi’s… this month, nearly all 8 sales have been more modern semi’s and give us a better idea of the values. Again, July 2017 was a very slow month, and when looking at a chart, it will show a big valley that will need clarification as to why the big price drop that month. While I do no predict we will match the August 2016 total sales for the month of 18 sales, I think we will get close, between 16-18 total sales and the average price to remain close to $645,000. There are currently 3 Semi’s with a SC status. The sales figures for townhomes is also looking really good in comparison to July 2017. with 7 sales already reported, compared to 8 in all of July, the volume of sales shows that there is still good demand for this housing stock. The average price is also up from July this year by over $26,000, with an average sales price sitting at $681,143. That is over $92,000 higher than the average sales price in August 2016 ($588,671) when there were 14 sales for the whole month. I am Predicting Sales should be around 13-15 sales for the whole month with the average sales price staying close to the $680,000 mark. If you would like to receive my exclusive Market report, called “THE MARKET: Newmarket’s Monthly Residential Real Estate Report” directly in your inbox each and every month, CLICK HERE.